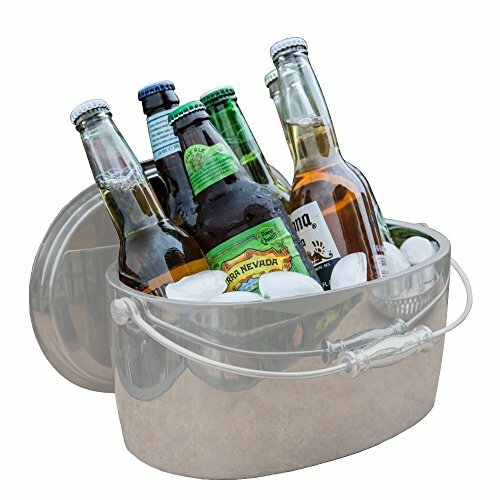 Save 1% on the Crafthouse by Fortessa Professional Metal Barware/Bar Tools by Charles Joly, 12'' x 5.25'' Stainless Steel Ice Bucket with Handle and Drain Tray by Crafthouse by Fortessa at Verve Wine Bar. MPN: 610321-CRFTHS.5.3013. Hurry! Limited time offer. Offer valid only while supplies last. Crafthouse by Fortessa is a comprehensive barware collection for the aspiring home mixologist, designed by World Champion bartender, Charles Joly. Crafthouse by Fortessa is a comprehensive barware collection for the aspiring home mixologist, designed by World Champion bartender, Charles Joly. Charles has applied his bartending ethos to the broad line of tools and glassware to bring the authentic cocktail experience home. Inspired by prohibition-era barware and updated with contemporary ergonomic principles, Crafthouse by Fortessa provides all the tools to create professional grade cocktails at home. Each piece is designed from the golden age of cocktails and the streamlined simplicity of Deco architecture. Charles Joly is a James Beard Award winner and a lifelong food and beverage professional. The Chicago-native is a certified mixologist who focuses on a balance between the classics and his own seasonal original cocktails. With a strong emphasis on knowing the roots of the craft along with a progressive vision for the future every feature is purposeful and every detail functional. Entertain like a world class bartender with Crafthouse by Fortessa. If you have any questions about this product by Crafthouse by Fortessa, contact us by completing and submitting the form below. If you are looking for a specif part number, please include it with your message.